A nuisance pest, but not harmful. Box Elder Bugs cause concern in the autumn when they gather in considerable numbers on the warm outside walls of homes and sometimes find their way into houses looking for a suitable place to over-winter. When they gain entry to buildings through cracks or other openings they remain in wall cavities and will occasionally emerge inside the home in the spring. They will not breed indoors, so there is no danger of starting an “infestation”. They cause no structural damage whatsoever but they can “spot” interior furnishings with their droppings. They can’t bite, they don’t eat anything on the inside of your house, including house plants, and they won’t harm your, your family or your pets. This bug is about 1/2 inch long and 1/3 as wide. It is black with three red lines on the thorax, a red line along each side, and a red line on each wing. The wings lie flat on the back when at rest. Eggs are a rusty red colour and are not often seen as they are deposited on boxelder trees. The young nymphs are red and grey. The population of bugs may number into the thousands resemble adults but do not have fully developed wings and are not able to reproduce. The change from nymph to adult is a gradual one. The adult bugs lay eggs on the host trees in the spring and the nymphs emerge in a few days. The nymphs are small and show more red than adults. These nymphs develop into adults during the summer, then mate and lay eggs which hatch into the nymphs of the second generation. 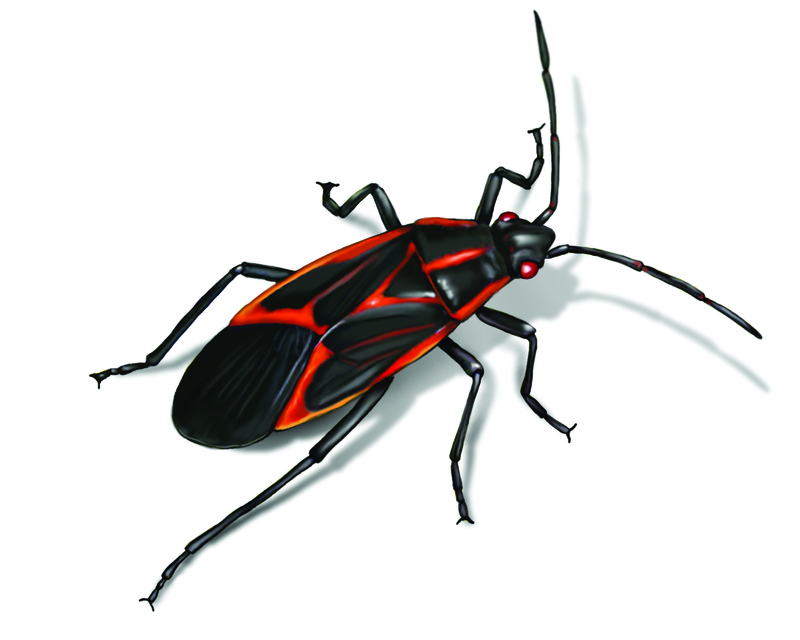 In the summer, box elder bugs normally feed on the leaves, flowers, and seed pods of the boxelder tree or silver maple. The bugs cause little damage to trees. Activity of nearly fully grown nymphs is noticed in August and September when they gather in large numbers on the trunks of box elder trees. The migration of the adults begins at this time. An obvious way to avoid infestation by this pest in residential properties is to get rid of near-by female boxelder trees. If this species is to be planted as an ornamental or shade tree, male trees should be purchased from the nursery. They are propagated by cuttings from staminate trees. Chemical control can best be obtained by spraying nymphs on the host trees before the adults have had a chance to migrate. Sunset Nursery advices using EndAll 2. Once box elder bugs have moved into the cavities of a home in the fall, there is little that can be done to eliminate them. Control or exclusion must be done in the summer and fall. Removing all boxelder trees in an area will prevent breeding. Caulking windows and doors and repairing window and door screens will prevent bugs from entering a home. If you decide you would like to spray for control, one home remedy is to use a 3-4% mix of water and soap (by volume) that can be sprayed directly on the insects. Remember however that soaps only kill on contact. In extreme cases have a rest control professional apply a residual insecticide to exterior walls in the fall where the bugs are congregating – this will tend to discourage them from landing. Insecticides are not very effective after the weather turns cold. When the bugs decide it’s time to leave the cavities in a home, some of them may be attracted to the warm atmosphere in your living space. They want to get outside but inadvertently end up inside. A good way to eliminate them is the vacuum the bugs up with a long hose attachment. If you squash them they may stain the walls or fabric. Remember they are harmless to humans and homes.